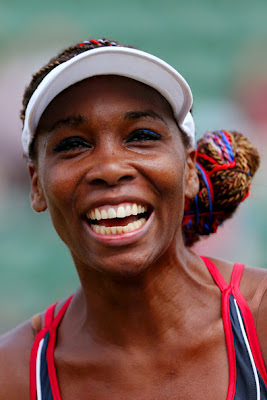 2012 OLYMPICS: Venus Takes Out Wozniak In A Take No Prisoners Mode! American Venus Williams celebrating her 2012 Olympics round two win. Wow! American Venus Williams hit the ground running this morning and did not stop until she was the victor. In a brief sixty-three minutes, Venus possessed the steely eyed focus that we have seen her employ so many times over the years, and very cleanly sent Canadian Aleksandra Wozniak packing at the end of round two, as she heads to round three. Wozniak's seven winners and two aces paled in comparison to the thirty-two winners and five aces that flew off of her opponent's racquet. Wonderful to see Venus not just win, but looking happy and not as fatigued as she had become in recent times. When asked how she was feeling out there, Venus responded, "I have Sjögren's Syndrome everyday, that is a part of my life. Some days I manage it, some days I don't... but I'm learning." She also addressed something a tad less significant, she said "I broke a nail." If that is what worries Venus post-match these days, we'll take it! Next up for Venus in round three is Germany's Angelique Kerber.